Rim and Mortise cylinders may be keyed to integrate with most existing Wilson Bohannan keying systems, and can be adapted to most other standard OEM keyways and systems. Both Rim and Mortise cylinders are 1 1/8" in length with beauty rings. 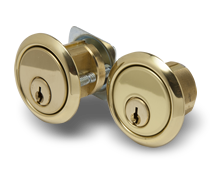 Mortise Cylinders are available in seven different cam styles, with brass or satin chromium finishes. Rim cylinders feature two sizes of breakaway tailpiece to fit the thickness of most standard doors.